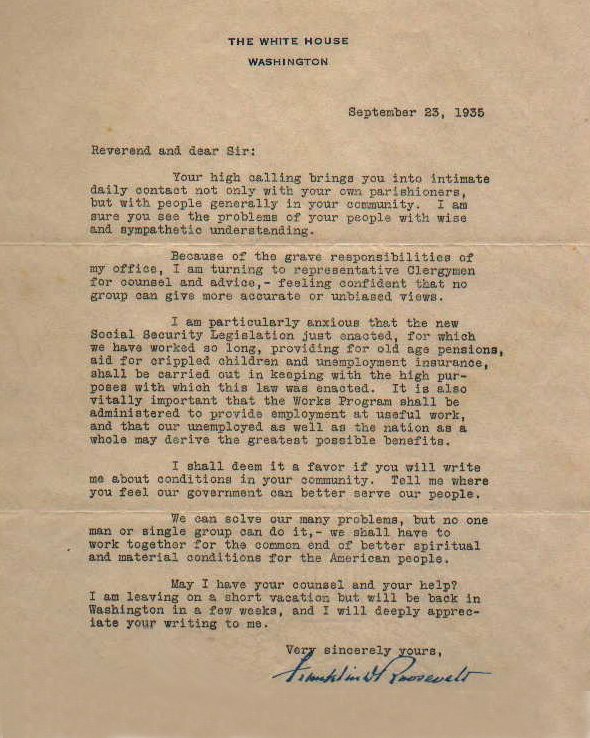 In September 1935, shortly after the Congress adjourned without passing the Second Deficiency Bill, President Roosevelt sent this form-letter to thousands of clergymen around the country. Due to the filibuster by Senator Huey Long (D-LA), the budget bill for the new Social Security program was not passed (it was contained in the Deficiency Bill) and so the new program had no appropriated funds with which to operate. It was this circumstance which led FDR to write to the Clergy in the hope that he could enlist their grass-roots support for a push to fund the new programs under the Social Security Act. FDR's Letter to the Clergy. SSA History Archives.